Well, you don't need good grammar with a shader like that, friend. Looking great DotCam. Are you intending to release this as a free tutorial, or as part of a marketplace submission? Either way, keep us updated! Are you intending to release this as a free tutorial, or as part of a marketplace submission? Either way, keep us updated! Thanks Havoc! The tutorial and any content released would be free, I don't have any plans to market this. It is just a project I am working on to learn some of the more advanced techniques, as well as something I may someday incorporate into a game. Fantastic Work DotCam! I would really like to see this implemented into a project at some point. 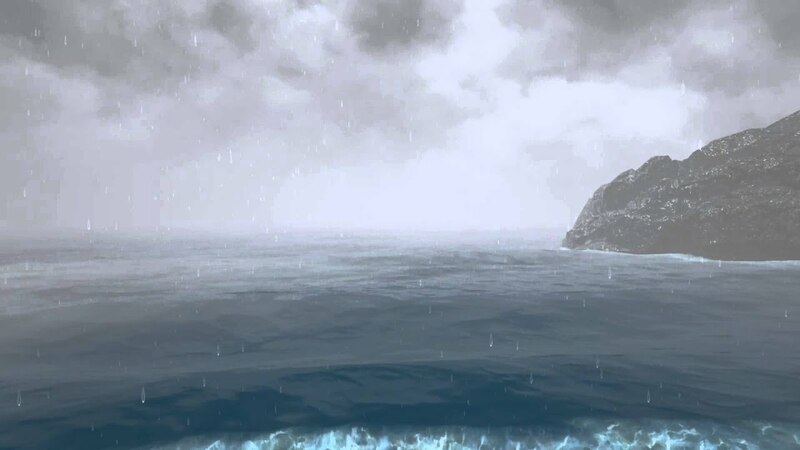 Be sure to keep us updated as you progress along with your Ocean Shader. Have a great day and be sure to keep up the great work! Great job pal! The surface moves in a very good way! Keep up the good work! Thanks Sean! Great to hear from you! I have been keeping notes while working through this, so hopefully it will make a good tutorial in the end. Thanks berna! And thank you for all of your help with getting this set up, much appreciated! In the video I was using 8 of them actually, I have tested with a range of waves from 2 up to 16 each with varying direction and amplitude. I added a bunch of switch statements so I can add more waves from a material instance, with all of the values hooked up with parameters as well for each wave. It took a while to set it all up, but being able to adjust properties in an instance has been a huge help. Eventually I will move them all back into a function to keep things organized, but having to compile shaders for every little change was driving me crazy, so until I find just the right mix of values I am going to leave them in the material. What kind of a plane do you use? Mine is 2048x2048 subdivided 120x120 and then scaled in the editor with 1x tessellation. I am probably going to need to increase the size & subdivision to get the wave peaks to look better. I will be experimenting with this in the coming days, the performance so far is really good so I am not too worried about increasing the detail a bit. I am working on the foam and color at the moment, trying to get it to look more realistic like yours looks! Thanks again. That's some nice work DotCam! I think that those waves look really cool! nice motion. feels very real. Thanks in advance for sharing the tutorial and a sample, DotCam. It looks good. Just wanted to note I have updated the original post with the video below showing some of the customization options, and a very early wip look at some foam! Hopefully this longer version shows better details, but I left the link for the original video in the first post as well. A quick update on my shader, I haven't been able to work on it as much as I'd like, but finally have a new video update. I have managed to switch over to a translucent material, due to the wave heights overlapping I was encountering an issue with translucent depth sorting causing issues, but have that under control now. I have also moved all of the material parameters into a blueprint so everything can be controlled in one place. Still need to add in many more features, but translucency with proper depth shading was not as simple as I expected. @DotCam, awesome work man, I've been watching this with keen interest. A post by n00854180t HERE about a T3D WaterPlane system is what I will be attempting soon. Let me know if you need any help with that, I helped write that code (or whatever the original version of it was). All (or at least most of) the magic happens by creating a vertical skirt on the edge, and stretching it out to the horizon, and having it parented to the camera. I think there may be some trickery in the shader as well, can't really recall. Hey thanks man, good to hear from you! 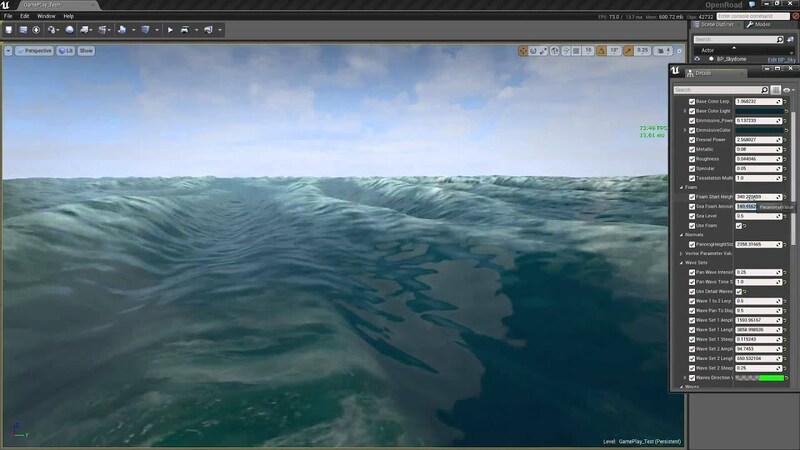 And yes, I will certainly be needing help with the infinite water plane, I have tested out some LOD's with separate material instances and have had some success, however your system sounds so much better, and would love to get it working! I have not been able to do any work on this yet, but I would like to be able to release this as free content when it is complete for people to add into their game, so I want to try and keep the system as simple as possible, while allowing it to be extended by users. If I could get it working with good performance, a BP only system would be ideal for the example project (from the looks of the code it doesn't look possible to do BP only, but maybe a simpler system). But I would also like to create a more advanced system in code to use in a project sometime in the future. Any ideas or thoughts on how you would go about the simpler system are most welcome! But if code is necessary, I am not against using it at all, just less code the better so it is simple to understand for those who may download it in the future. Thanks again! So it should be doable without any code. The main thing is how the grid vertices are done. How it works is first of all being parented to the camera position and z-axis rotation (other axis rotations don't affect it). It has a central grid, a border grid surrounding the inner grid and which is stretched to the far view distance, and then a "wall" of horizon quad, forming a type of skirt that goes directly upwards from the border grid. So as long as you can create a mesh that looks like that and change the vert positions, it should be doable without any C++ code. Not sure what's available in that respect, but I imagine it should be doable. The setupVBIB function has a lot of comments on how the grid and stuff is set up, so going over it should help. It's been a while since I updated this thread, translucency has been a major headache for the ocean system. For that reason I will be releasing two versions of the shader, opaque & translucent, so you guys can get good results no matter what. 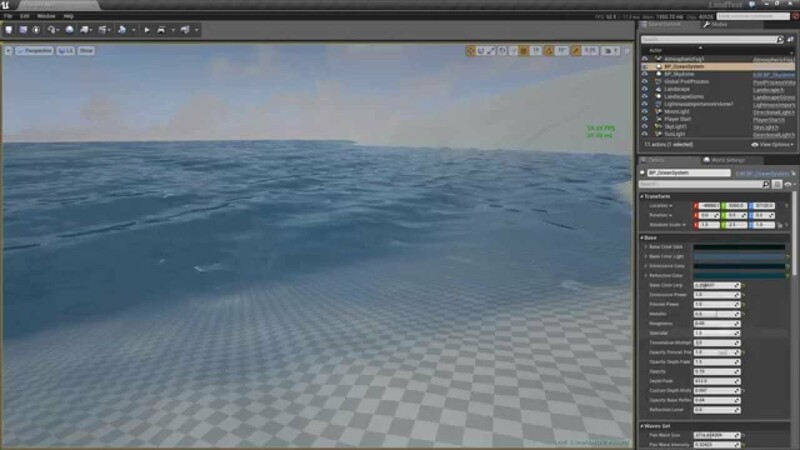 The translucent material would be better for scenes closer to the shore and areas you want to see underwater, for the open ocean though you can get away with an opaque material in some cases. This was thrown together rather quickly, so the rain and lighting effects are not custom made but instead modified versions of assets from the example content, but I will be re-creating them soon. The sky is made up of a few layers, with a large sky sphere that controls the dynamic TOD sun/stars and atmosphere colors, a moon mesh, an inner sphere for additional atmosphere modification, a panning cloud layer on a dome shape with directional control, a wip particle cloud generating system, random lightning particle generator, and HeightFog all combined into a BP that is highly customizable. It needs some more work, but I am happy with the results so far. I should have everything ready to distribute fairly soon (an 'alpha' version at least, it needs more work), hopefully either later this week or early next week. I will update the thread with more details soon. @n00854180t - I have been trying to get a better mesh setup working, so far it has not worked out, changing the vert positions in a BP is creating a lot of artifacts when playing in editor. I abandoned that approach for the time being going back to a large sub-d plane as the tessellation does a pretty good job, but it's still something I would like to try and implement at a later date, so thank you for all the info and I will keep you posted on how it goes!